Following one of the worst appearances of his storied career, a dispirited Roy Halladay admitted Sunday he is dealing with discomfort in his right-shoulder. The two-time Cy Young Award winner was walloped by the Marlins on Sunday, surrendering nine runs in 2 1/3 innings in a 14-2 loss at Citizens Bank Park. "It's not something I had before, it's something new this year," Halladay said. "I felt good all spring and felt good all year. I just got up after that start against Pittsburgh [April 24] and had soreness in there and just wasn't able to get ready. That's really all I have. We don't have a lot of information on it. We did some tests, and obviously they aren't completely conclusive as to what it is. There's a couple different options, and I think the scans, the MRIs, the CTs and that kind of stuff will give us more information, and we'll address it then. We'll see how it plays out here in the next couple days"
In his past two starts Halladay has surrendered 17 earned runs over just six innings. He gave up eight runs over 3 2/3 innings against the Indians on Tuesday, and allowed nine runs on just four hits Sunday. The 35-year-old said he expects to fly to Los Angeles and be examined by renowned orthopedist Lewis Yocum early this week. General manager Ruben Amaro Jr. said it's likely Halladay will spend time on the disabled list. "Up until now, he hasn't really expressed and discomfort," Amaro said. "He hasn't been on our injury reports, but now it seems like we will have to DL him. Until we do some diagnostic work, we won't know exactly what's going on with him. Clearly, it does not seem right now like he's very healthy and it was pretty apparent with his performance, unfortunately." Halladay first told the club of the shoulder discomfort following Sunday's contest. He was examined by team physician Dr. Michael Ciccotti, but nothing conclusive was found. 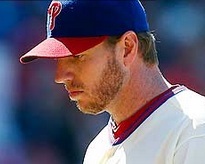 Halladay opened the season with two poor outings, resulting in a 14.73 ERA. He then put together three strong performances, scattering eight hits over 21 innings while amassing a 1.71 ERA. The consensus following his start against Pittsburgh was that he adjusted his mechanics and was regaining confidence, but those thoughts vanished with his previous two performances. His next start is scheduled for Friday in Arizona. "We have to figure out what we're going to be doing with our roster and who's going to be pitching [Friday at Arizona]," Amaro said. "If the man's hurt, he's hurt. Now we'll have to try to get him well and move forward." - Patrick Gordon is the Managing Editor for the Philadelphia Baseball Review. Follow him on Twitter @Philabaseball or contact him at pgordon@philadelphiabaseballreview.com.